Gone are the days when consumers were satisfied with their home appliances performing only basic functions and tasks. Now the average buyer is looking for more value and convenience, whether it’s multi-functionality or the ability to turn on appliances remotely via an app. Undoubtedly, the home appliances sector is undergoing a subtle transformation – state-of-the-art home appliances boast connectivity and interactivity features which aim to offer consumers an improved and more personalised experience. 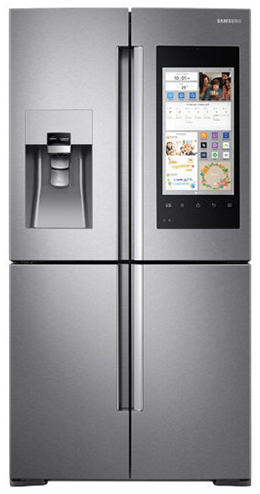 Take for example the Samsung Family Hub™ smart fridge freezer, which features a touch-enabled LCD. It allows you to see what’s inside the fridge via internet connectivity as well as giving users access to various apps and serves as a TV screen. As Samsung’s product shows, one way to make home appliances more interactive is by equipping them with high-resolution, touch-enabled displays that can communicate useful information to the users. For example, the traditional user manual can be replaced with interactive on-screen content that can be supported by video. Imagine a smart coffee machine that has a display that provides a step by step guidance on how to make an Americano, or shows some facts about where particular beans originate from, or even better, promotes the latest coffee offerings at the local store. Active displays on home appliances can also serve as a powerful branding platform for OEMs who can benefit from advertising their products or third party consumables. They can be a way of targeting the consumers directly and enhancing a brand’s image, while consumers can benefit from promotions, recipe ideas or other information. 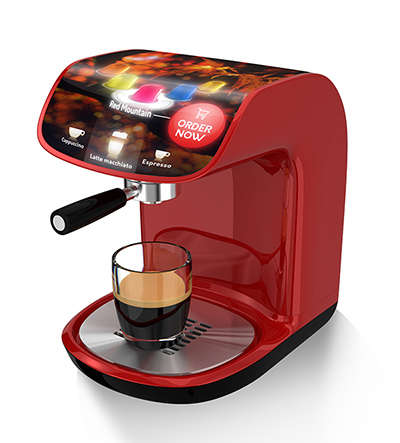 Coffee machine concept with an integrated curved OLCD. We may be used to the rectangular shape of a fridge, but many home appliances have curved and non-rectangular designs, and yet would benefit from a display. 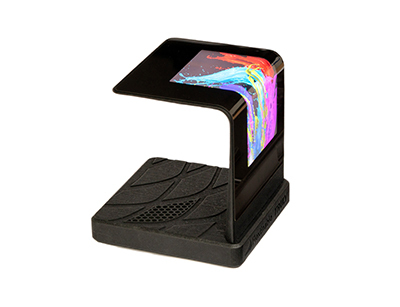 Therefore display modules are needed that can be bent and curved around surfaces in order to enable their easy integration into devices without compromising their aesthetics. These displays need to be able to show vivid colours and images in high resolution as well as play video content if they are to be used for branding and advertising. Such requirements cannot be addressed with low resolution passive LCDs and therefore the displays need to be active. LCDs on the market are made on glass and therefore they cannot conform to surfaces. One of the most flexible display technologies is flexible OLED, but flexible OLED displays are not yet ready for integration into products due to limitations with their lifetime and relatively high manufacturing costs especially when larger sizes are required. Organic LCDs (OLCDs) made using FlexEnable’s organic thin-film transistor (OTFT) technology are thin, light, conformable and can have any shape. They can even have holes in the display. They have the advantage of combining the maturity and lifetime strengths of existing LCD technology with flexibility and robustness. These displays can achieve a bend radius down to 10mm which is sufficient for wrapping them around the corners of most smart home appliances. The flexibility of the OLCDs is realised by replacing the rigid glass used in glass LCDs with flexible low cost plastic substrates and replacing rigid amorphous silicon thin film transistor technology with high-performance truly flexible OTFT technology. FlexEnable is working with its supply chain and manufacturing partners to bring OLCD to the market by the end of 2018. For more information on OLCD, please get in touch with us at info@flexenable.com.